This is my "baby" Sable and we live in Dripping Springs, TX ... She was my 40th birthday present from my husband Rick. Sable is three to four months old. 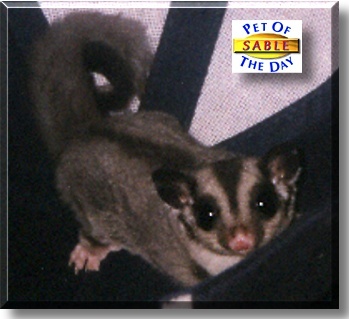 Sable is a Sugar Glider which is a marsupial, which relates to the kangaroo and koala family. They are nocturnal, which means they sleep during the day and play at night. If you notice from the picture, her eyes are big and black, totally dilated, can't handle too much light. Sugar Gliders actually "glide" through the air, descendants of the flying squirrel, they have membranes that act as "wings". When you adopt these babies you have to keep them on your body for at least 30 days so you can bond to you, meaning that you will be their "mom". Sable loves to jump right down my blouse when I pull her out of her cage "that's home". When she gets upset, she "crabs" so loud, that you cannot believe that it comes out of such a small body! Her favorite thing is to rub noses with me!